Look into the childhood of any highly innovative American artist of the past couple generations, and you'll probably find at least a trace of Sesame Street. The long-running children's public television series, though widely regarded as a sound source of entertainment and education for the country's youngsters, has also done more than its part to expose its quite literally growing audience to the vast possibilities of creation. This has proven especially so in the realm of music, where the show's performing guests have included Herbie Hancock, Nina Simone, and Grace Slick — to name just three of the ones we've previously featured here. But Sesame Street, known in its heyday for a steadfast refusal to talk down to its viewers, no matter how small, has also demonstrated a reach far outside rock, pop, and soul. In 1979 it aired "Geometry of Circles," a series of four animations with music by minimalist, "repetitive structure"-oriented composer Philip Glass, who turns 80 years old today. Producer Cathryn Aison, according to the Muppet Wiki, commissioned Glass to score her visual work, whose storyboards had already gotten the go-ahead from Children's Television Workshop. The music she received from Glass to accompany this show of shape, line, and color "underscores the animation in a style that closely resembles the 'Dance' numbers and the North Star vignettes written during the same time period as his Einstein on the Beach opera." "Glass has written scores to The Truman Show and Notes on a Scandal and his style is much imitated," writes Telegraph "opera novice" Sameer Rahim by way of background on the composer's wide range of other work in a review of his five-hour formalist collaboration with experimental theater director Robert Wilson. "Anyone, like me, born in 1981 has absorbed his musical grammar without realising." Though a few years too young to have caught "Geometry of Circles" in its first run (and having grown up in the wrong country in any case), the willingness of creators like Glass to work in all kinds of settings, and the willingness of venues like Sesame Street to have them, planted the seeds for countless careers, both today's and tomorrow's, in art, in mathematics, and no doubt even in experimental opera. Below you can listen to an 80-track collection of Glass' work. The Spotify playlist is simply called, "This is: Philip Glass." If you need Spotify's free software, download it here. There's lots of sturm und drang here in America--enough that we didn't get to pay our respects to Mary Tyler Moore, an icon of 1960s and 1970s television. Above, we give you our favorite tribute. Joan Jett performing a sweet rocking cover of "Love is All Around," the original theme song from The Mary Tyler Moore Show. If you came of age during the 70s, you'll surely know the song. Jett's performance was recorded on The Late Show With David Letterman back in 1996. Mary, you will be missed. The biography of Trigger is inseparable from the story of Willie Nelson’s rise to fame, and we get a brief tour of his career above. Nelson began as a traditional buttoned-up Nashville crooner, but he decided to retire his act and move back to Texas to farm. Then he found Trigger. That meeting of player and guitar possibly reinvigorated Nelson’s entire career, inspiring his move to Austin and his complete reinvention of country music. "Willie Nelson and His Famous Guitar: The Tale of Trigger" will be added to our collection, 1,150 Free Movies Online: Great Classics, Indies, Noir, Westerns, etc.. When totalitarian regimes around the world are in power, writing that tells the truth—whether literary, journalistic, scientific, or legal—effectively serves as counter-propaganda. To write honestly is to expose: to uncover what is hidden, stand apart from it, and observe. These actions are anathema to dictatorships. But they are integral to resistance movements, which must develop their own press in order to disseminate ideas other than official state dogma. Paris is firing all its ammunition into the August night. Against a vast backdrop of water and stone, on both sides of a river awash with history, freedom's barricades are once again being erected. Once again justice must be redeemed with men's blood. Who would dare speak the word “happiness” in these tortured times? Yet millions today continue to seek happiness. These years have been for them only a prolonged postponement, at the end of which they hope to find that the possibility for happiness has been renewed. Who could blame them? ... We entered this war not because of any love of conquest, but to defend a certain notion of happiness. Our desire for happiness was so fierce and pure that it seemed to justify all the years of unhappiness. Let us retain the memory of this happiness and of those who have lost it. These lucid, passionate essays “include little that is obsolete,” wrote Stanley Hoffman at Foreign Affairs in 2006. “Indeed it is shocking to find how current Camus’ fears, exhortations, and aspirations still are.” Hoffman particularly found Camus’ demand “for morality in politics” compelling. 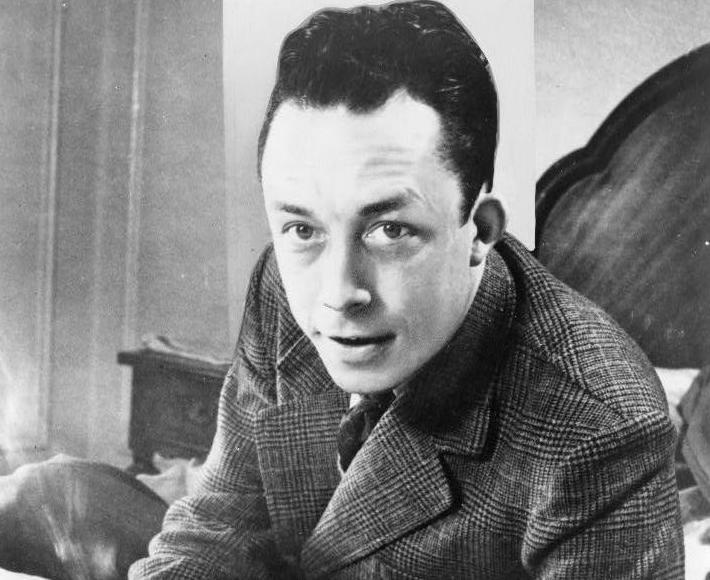 Though “deemed naïve... [by] many other philosophers and writers of his time,” Camus’ insistence on clarity of thought and ethical choice made for what he called “a modest political philosophy... free of all messianic elements and devoid of any nostalgia for an earthly paradise.” How sobering those words sound in our current moment. 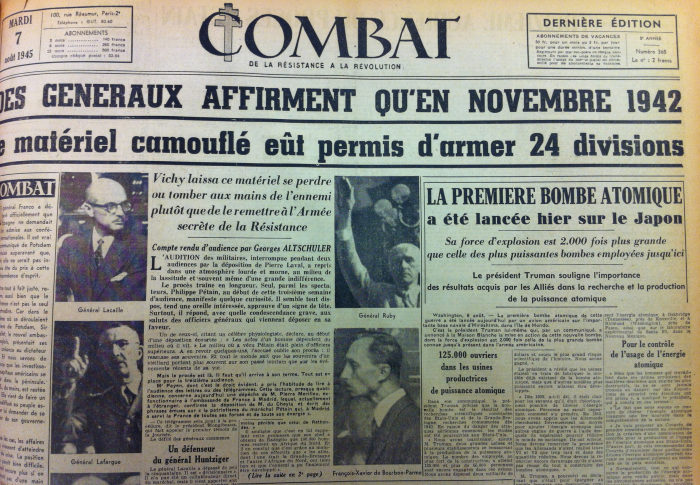 Camus’ Combat essays have been collected in Princeton University Press’s Camus at Combat: Writing 1944-1947 and in Between Hell and Reason: Essays from the Resistance Newspaper Combat, 1944-1947 from Wesleyan. In July of 2015, 1,000 musicians gathered together in Cesena, Italy and performed in unison a rollicking version of the Foo Fighters' song "Learn to Fly." Now, they're back and playing the best-known song from Dave Grohl's earlier band. We're talking, of course, about Nirvana's hit, "Smells Like Teen Spirit." Here we are now. Entertain us. Ladies and gentlemen, the world's largest rock band. Arendt blamed victims who were forced to collaborate, critics charged, and made the Nazi officer seem ordinary and unremarkable, relieving him of the extreme moral weight of his responsibility. She answered these charges in an essay titled “Personal Responsibility Under Dictatorship,” published in 1964. Here, she aims to clarify the question in her title by arguing that if Eichmann were allowed to represent a monstrous and inhuman system, rather than shockingly ordinary human beings, his conviction would make him a scapegoat and let others off the hook. Instead, she believes that everyone who worked for the regime, whatever their motives, is complicit and morally culpable. 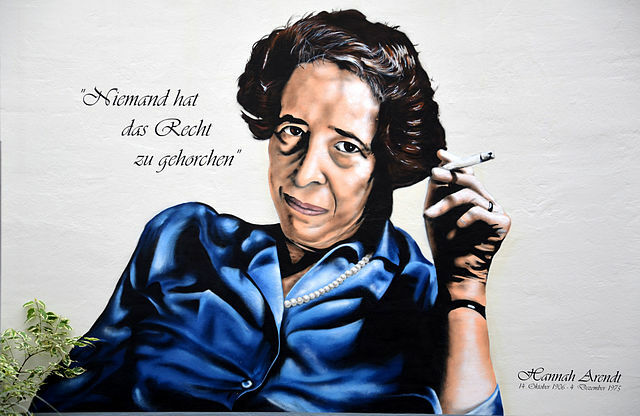 While this circumstance may provide a "legal excuse," for killing, Arendt seeks to define a “moral issue," a Socratic principle she had "taken for granted" that we all believed: "It is better to suffer than do wrong," even when doing wrong is the law. People like Eichmann were not criminals and psychopaths, Arendt argued, but rule-followers protected by social privilege. “It was precisely the members of respectable society," she writes, "who had not been touched by the intellectual and moral upheaval in the early stages of the Nazi period, who were the first to yield. They simply exchanged one system of values against another," without reflecting on the morality of the entire new system. Such refusals to participate might be small and private and seemingly ineffectual, but in large enough numbers, they would matter. “All governments,” Arendt writes, quoting James Madison, “rest on consent,” rather than abject obedience. Without the consent of government and corporate employees, the “leader... would be helpless.” Arendt admits the unlikely effectiveness of active opposition to a one-party authoritarian state. And yet when people feel most powerless, most under duress, she writes, an honest “admission of one’s own impotence” can give us “a last remnant of strength" to refuse. We have only for a moment to imagine what would happen to any of these forms of government if enough people would act “irresponsibly” and refuse support, even without active resistance and rebellion, to see how effective a weapon this could be. It is in fact one of the many variations of nonviolent action and resistance—for instance the power that is potential in civil disobedience. We have example after example of these kinds of refusals to participate in a murderous system or further its aims. Arendt was aware these actions can come at great cost. The alternatives, she argues, may be far worse.